International Observe The Moon Night? There are more than 275 events in 40 countries participating in this. I could not find one in Utah, but there is a FREE Stargazing party tonight at Stansbury Park Observatory. Check out the details here. You can also observe the moon from your own backyard! Our only natural satellite tends to get noticed only during unusual astronomical events — for example, when it blots out the sun during a solar eclipse, or when Earth's shadow creates a total lunar eclipse (as it will on December 22nd). In contrast, this Moon Night may seem as if it's occurring when the moon is in a ho-hum phase — not a brilliant full moon, nor a slender, svelte crescent, but a couple of days after its first-quarter phase. Well, it turns out that right now is the best observing opportunity in the moon's 29-day cycle. Space.com's skywatching columnist, Joe Rao, points out that the full moon is so bright that details on the surface tend to look flat and washed-out. 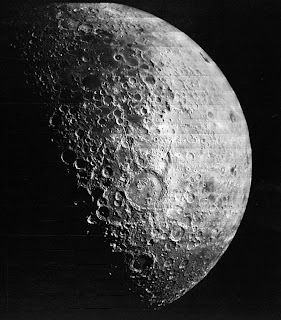 Just after first quarter is a much better time for seeing the moon in post-sunset skies, and for picking out the shadowed mountains and craters in sharp relief. What's more, nearly all of the moon's best features are illuminated. Copernicus Crater: This prominent crater toward the upper left of the lunar disk spans 60 miles and is a mere 800 million years old. Huge rays of lighter material emanate from the impact site, which is surrounded by the ancient Carpathian Mountains. Tycho Crater: 50-mile-wide Tycho is thought to be even younger than Copernicus — perhaps 100 million years old — and is surrounded by a similar burst of rays. The impact that created Tycho caused material to splash up and create a characteristic central peak. Seas on the moon: The lunar "maria," or seas, are smooth stretches of the lunar surface filled with volcanic lava from a long-ago phase of lunar geology. The Sea of Tranquility is one of the best-known maria because it was the site of the historic Apollo 11 landing in 1969. Just last year, NASA's Lunar Reconnaissance Orbiter sent back pictures showing traces of the landing site. The terminator: The line between light and dark is the best place to look for dramatically lit craters and mountain ranges, particularly if you're looking through binoculars or a telescope. Among Saturday night's must-see craters along the terminator are Schiller, Gassendi and Kepler. CLICK HERE to see details of the above features. Content taken from msnbc.msn.com. CLICK HERE to read the full story, and to read more about the moon. CLICK HERE to be taken to the official Observe The Moon Night website. Cool, my son has been learning about the phases of the moon at school, this is perfect timing!